MOSAIC art quilts could also be called “stash buster” art quilts because you get to use small pieces of fabrics from your entire stash! More fun though is that mosaic art quilts give you a chance to play with colors in a very intimate way. 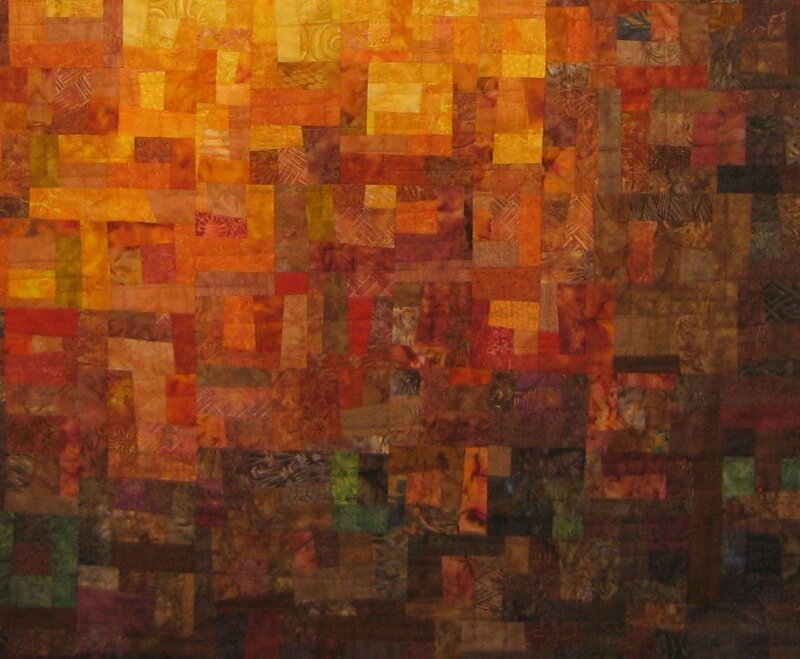 Some of my earliest art quilts were mosaic quilts. In my next few blogs I’m going to talk about different ways to piece mosaic quilts and specifically ways to create more contemporary designs, more “outside the block” opportunities!! As most of my blog followers know, I’m not a standard/same size block person. In fact, if it starts to look like a repetitive block, you’ll see me running to the hills! There is nothing wrong with blocks but I like the challenge AND I Iike the artistic effect of more random, irregular, and unexpected piecing. Diagnonal rows of random sizes but same width blocks. Crazy piecing on design wall with no blocks, just pieces of fabric. 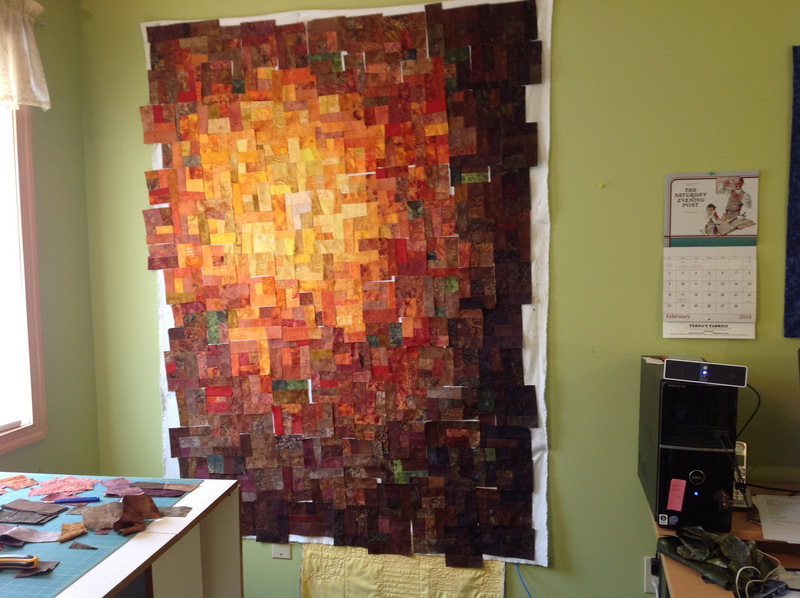 My goal in piecing a mosaic art quilt is to draw your eye to the colors. I want you to see the ebb and flow as the colors blend into and out of each other. I want the lines of the piecing to be secondary, almost in the background. I don’t want you to easily figure out how it went together but instead to see the colors first, not the structure. This blog will focus on the Small Random Shaped, 3 piece blocks. 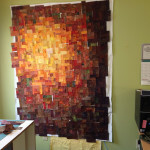 The first pict ure shown is a very large (for me) art quilt, 40″W x 60″H, composed of about 180-200 smallish (before sewing together roughly 3.5″ x 4.5″) random sized blocks usually with 3 pieces in each block. These three pieces are sewn together randomly into a block which is then cut into an off kilter square. There are 4 sides but the sides are often not “square” as per the lines on your cutting mat, not 90 degree angles. The second photo is a close up where you can see the “blocks” easier. 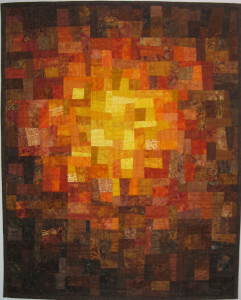 When creating a quilt like this, you need a game plan for the way you want the colors to flow. 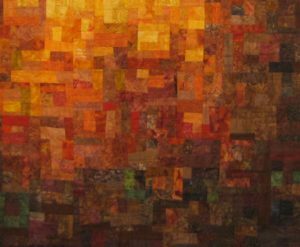 I usually start in the middle, in this case, with some yellow and gold 3 piece blocks, then start piecing some yellow with one piece with orange, then 2 orange and 1 yellow…etc. You place them on your design wall and watch the colors meld and expand. No matter my prep I always find I make blocks that don’t fit well with the color progression, just set those aside. 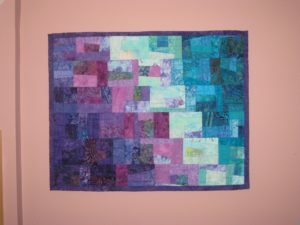 Sometime I might add a 4th strip to a block to make a color transition work better or I just save it for another quilt. 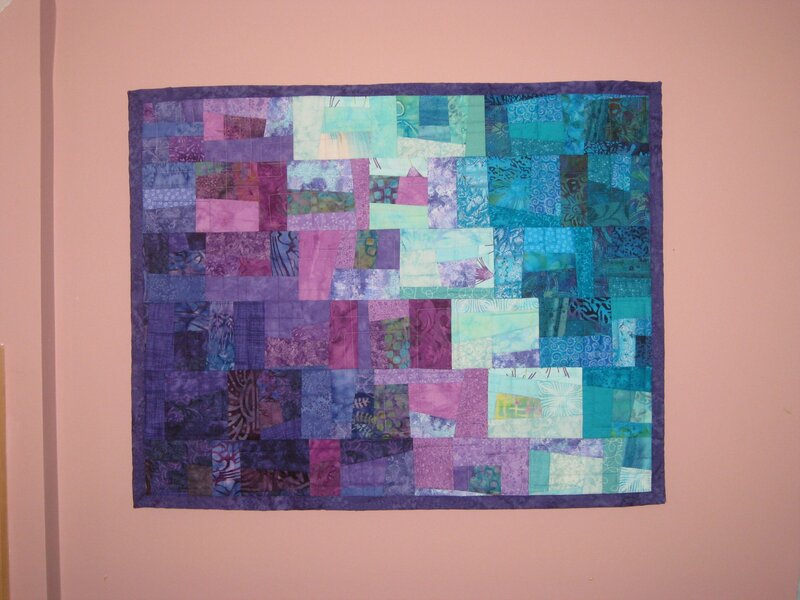 You can do whatever works for the colors of the quilt. When creating these little blocks I’m sewing straight lines but they are often lines not at 90 degree angles so the pieces might be smaller at one end than the other which gives you angled lines in your piecing. There is a lot of trimming and not much concern for precision of piecing because once the three pieces are together, you trim the sides (often like a lopsided square) to the wonky shape you want. Often I leave the 3 pieces in a rough form, pop them back up on the flannel wall, and move to the next small block, leaving the final trim to later, once I must figure out how to put it all together. The third photo shows all the small 3 piece blocks on the design wall just before I start to figure out how to put it all together for this larger mosaic quilt. The final piecing is done in sections, again, the goal being to break up the tendency for long vertical and horizontal piecing lines. Look carefully at the close up and you can see the lines but from 10 feet back it is the color that grabs you. For section piecing, I might look at 4-8 small blocks and figure out how to put those together into a bigger squarish, usually rectangle shape. If you look carefully at the close up, you can see the sections but they are created so they fit together randomly and not with piecing lines or rows or columns which go from side to side or top to bottom. I use a lot of wallpaper cuts to deal with the non straight lines. See a previous blog, 7/2/15 on Curved Quit Piecing where I discuss wallpaper cuts. 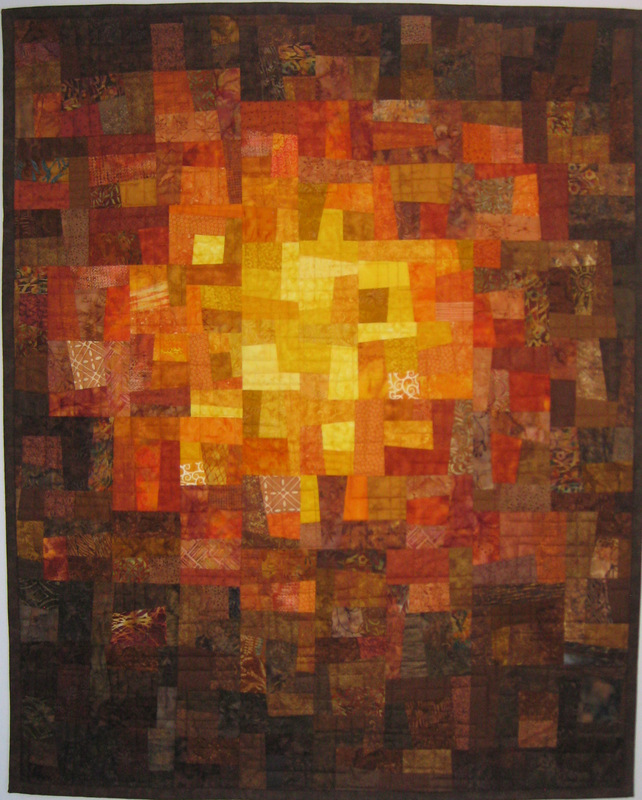 The final picture is one of my first mosaic quilts. You can see some 3 piece and some 4 piece blocks. The color progression is easier to sort out because it is angled sections. And, the rows are fairly straight but the piecing within each row is more random in size though lines are more straight on the outer edges of each block. Try something small first and a color progression that is easier to figure out. These are such fun and always unique!